I’m back from Sydney with some Illamasqua goodies! 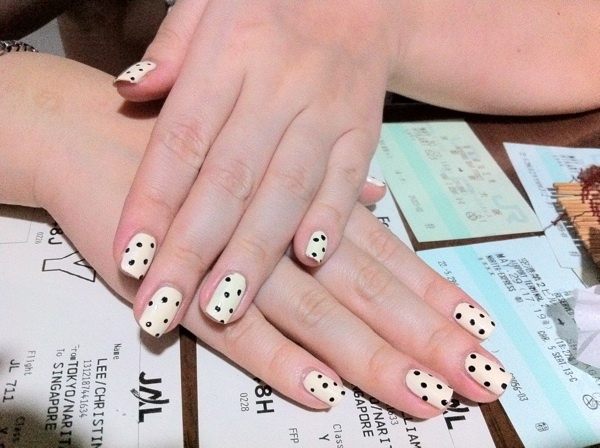 Here’s Load, a jelly-like off-white polish with a yellow tinge. This is part of a trio from the 2011 Valentine’s Day collection. 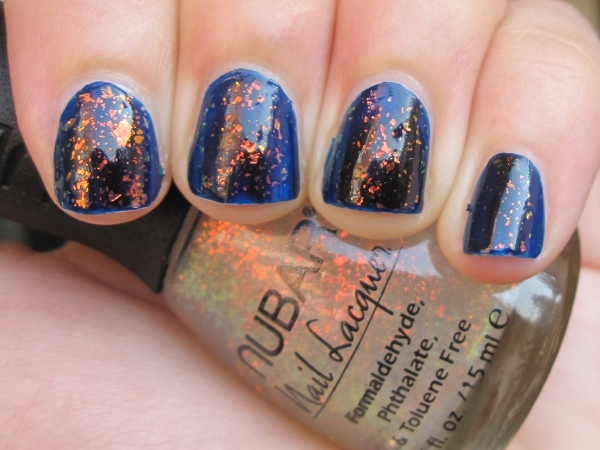 When I was doing my research for this polish, I noticed a lot of bloggers getting offended by the name. I know what the name means but perhaps because I don’t really hear anyone using it here, I don’t really get what’s so offensive about it. Here’s a comparison with Yellow Primrose. The colour is virtually identical but the finish is very different. While Load has a jelly texture, which required three coats to make even, Yellow Primrose is more creamy and stark. I prefer Load. It has a translucence about it that makes for easy wear. 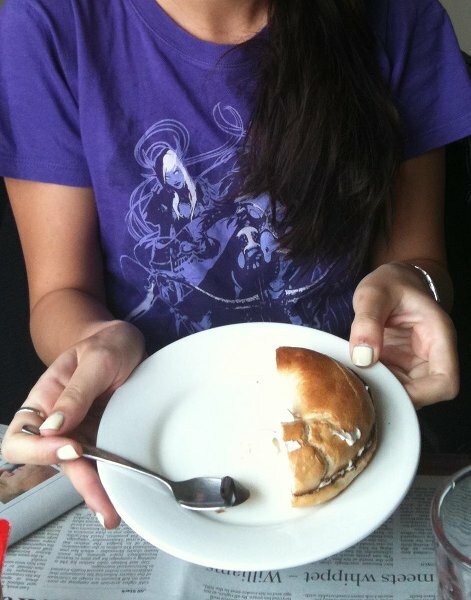 I found a random picture of me wearing Load and having breakfast. 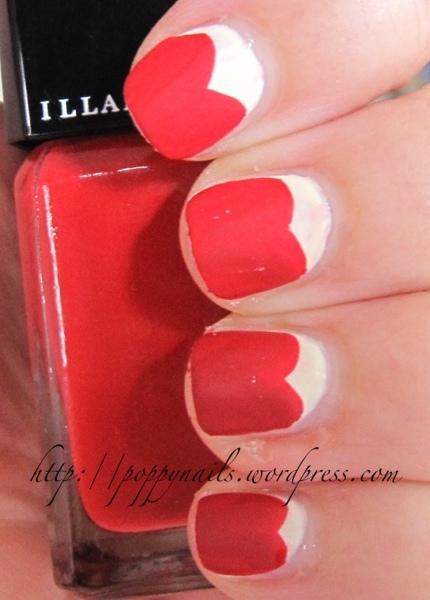 Throb is the other Illamasqua polish in the Valentine’s Day collection. Here I attempted a heart-shaped manicure. I don’t think it worked out very well though! 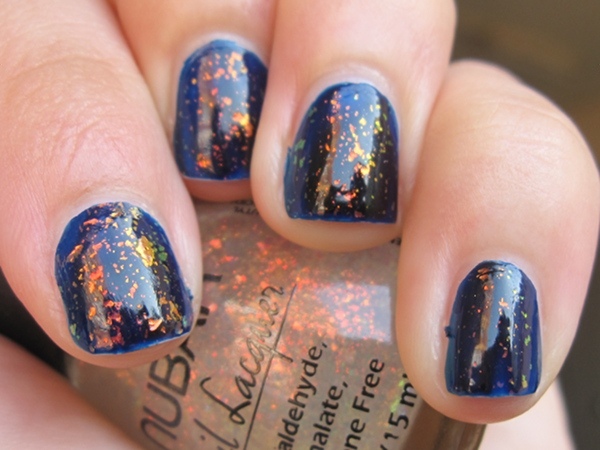 Nubar 2010 is a clear polish filled with multicoloured duochrome flakies. On a blue base, I see mainly green, orange and yellow, with the colours changing depending on the light. The different flake sizes also make it interesting. Some are big, others are smaller. On a dark purple base, I see a lot more orange than the other two colours. 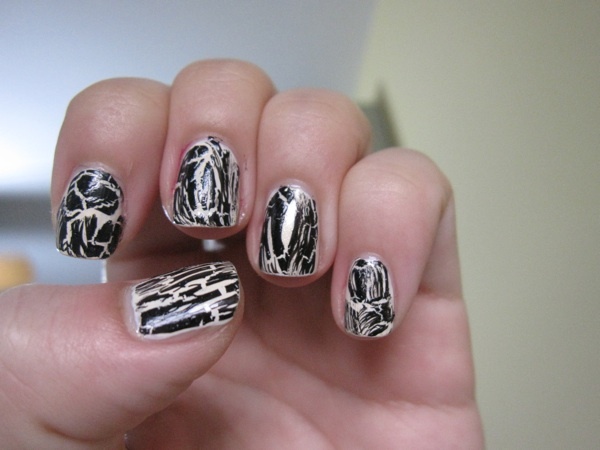 Overall, it’s an incredible polish for layering and an interesting twist to just plain glitter. 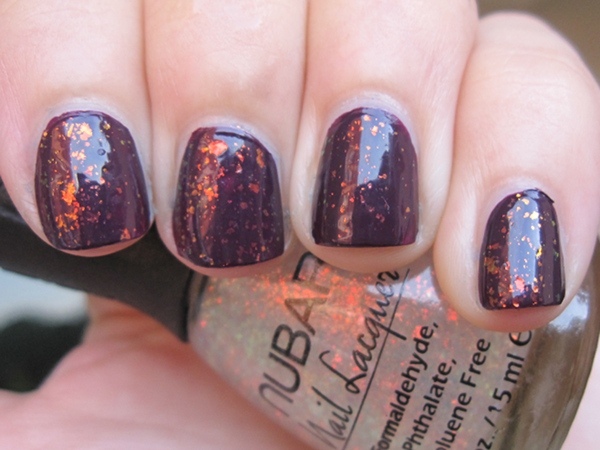 I’m beginning to like Nubar a lot, seeing as how the two polishes I have from this line are incredible. Nubar can be purchased off eBay to Singapore at a reasonable price. 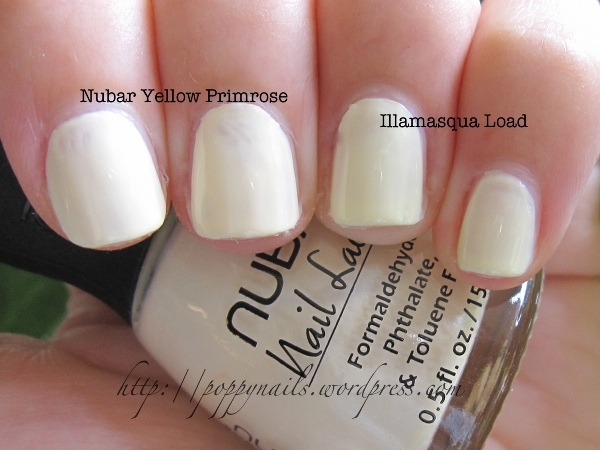 Yellow Primrose, from Nubar’s 2011 Spring Garden collection, is a pale buttery yellow creme with the faintest of all shimmers (I couldn’t see it, but Alicia, who detests shimmer, spotted it with her eagle eyes). The colour is super gorgeous but application leaves much to be desired. This is actually a three-coater because two thin coats leave behind some bald spots. But because I hate applying three coats of anything, I chose two careful thick coats instead. As you can see from the photo, it’s still not perfectly even though. Nonetheless, the colour is absolutely stunning and reminds me of vintage lace. I bought this off eBay. I don’t think Nubar is available in Singapore and its online store only ships within the US. 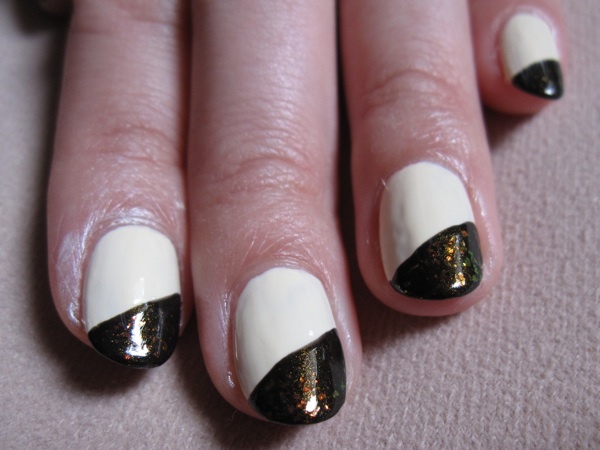 Lydia wanted to hid the roundness of her nail tips, so we decided to go with a blackish-colour triangle design. I used Nubar 2010 (which contains pretty duochrome flakes suspended in clear polish) over Wagon Trail to create more depth. You can see the green, yellow and red glowing prettiness most clearly in the third picture. Like black paint splashed over a yellowing canvas? This is my favourite nail art design with Yellow Primrose.